Huffington Post, May 5, 2016 -- A family living in poverty in China is desperately seeking outside help in the hopes they can get surgery for their infant son. Hong Hong, who is almost 4 months old, has polydactylism, or the congenital condition of having extra fingers or toes. It’s not an uncommon condition, affecting about one in every 1,000 live births, however, usually there is only one or perhaps two extra digits per limb. Hong Hong, who was born in Hunan province in January, has 15 fingers and 16 toes. He also has two palms on each hand and no thumbs. Hong Hong’s mom has polydactylism herself with twelve fingers and twelve toes. She and her husband say they’re seeking medical advice as to how best to treat their son. So far, doctors have warned that the surgery required to both remove the extra digits and to give the child reconstructed thumbs would be a complicated and expensive procedure. The surgery could reportedly cost as much as $30,000. For now, doctors say Hong Hong is too young to undergo surgery. They’ve recommended that the child be operated upon after he turns six months. 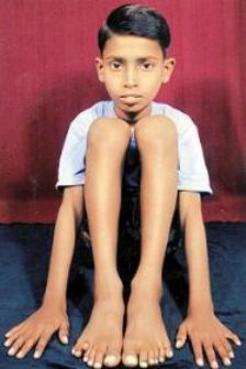 Polydactyly is a condition in which a person has more than five fingers per hand or five toes per foot. Having an abnormal number of digits (6 or more) can occur on its own, without any other symptoms or disease. 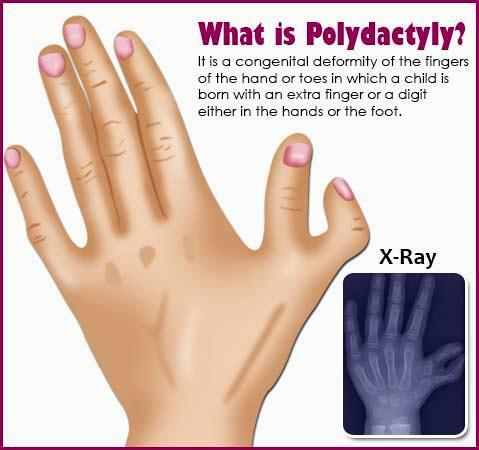 Polydactyly may be passed down (inherited) in families. This trait involves only one gene that can cause several variations. Extra digits may be poorly developed and attached by a small stalk (generally on the little finger side of the hand). Or, they may be well-formed and may even function. Poorly formed digits are usually removed. 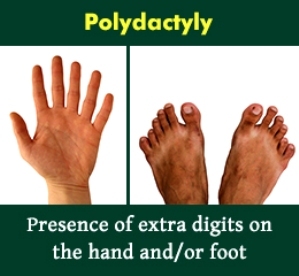 Typically there is no pain associated with polydactyly. When the hands and feet are developing in the womb, they start out as flat "paddles" that then normally separate into five digits. 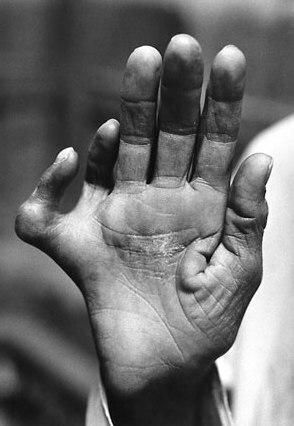 Polydactyly occurs when this separation process is excessive, and an extra "segment" is created. This may be caused by a genetic abnormality or by environmental influences. When the digits are still fused at birth, it is called syndactyly, in which two or more fingers or toes are fused together.